Rats cause structural damage to buildings by burrowing and gnawing. Our neighbor has found small holes gnawed through 2x6 boards (the wide way!) and are so small it looks like just the skinniest of snakes could pass through. However, her exterminator told her that they were definitely rat holes. Rats undermine building foundations and slabs, cause settling in roads and railroad track beds, and damage the banks of irrigation canals and levees. Or in our case, they've excavated a large amount of gravel and sand, and I'm surprised we haven't seen any obvious chicken coop foundation settling. Rats also may gnaw on electrical wires (one could only hope they get as far as the copper part) or water pipes, either in structures or below ground. They damage structures further by gnawing openings through doors, window sills, walls, ceilings, and floors. Considerable damage to insulated structures can occur as a result of rat burrowing and nesting in walls and attics. And then there's the smell of both rodent urine and dead rodents if poison suddenly caught up with them while nesting. The "three now cosmopolitan commensal rodent pest species" (the brown rat, the black rat and the house mouse) have been dispersed in association with humans, partly on sailing ships in the Age of Exploration. Together with with a fourth rat species in the Pacific, the Polynesian rat (Rattus exulans), they have severely damaged island biotas around the world. For example, when the black rat reached Lord Howe Island in 1918, over 40 percent of the terrestrial bird species of the island, including the Lord Howe fantail, became extinct within ten years. Similar destruction has been seen on Midway Island (1943) and Big South Cape Island (1962). Conservation projects can, with careful planning, completely eradicate these pest rodents from islands using an anticoagulant rodenticide such as brodifacoum. This approach has been successful on the island of Lundy in the United Kingdom, where the eradication of an estimated 40,000 brown rats is giving populations of Manx shearwater and Atlantic puffin a chance to recover from near-extinction. From wikipedia. When I was traveling around New Zealand, we heard a lot about the destruction of ground-dwelling birds such as the iconic kiwi. The rats had eggs for breakfast, baby birds for lunch and the occassional youngster for dinner. 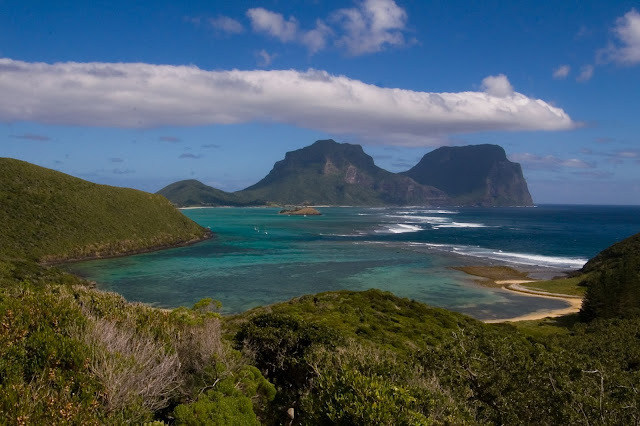 Lord Howe Island, image used with permission. The ship or wharf rat has contributed to the extinction of many species of wildlife including birds, small mammals, reptiles, invertebrates, and plants, especially on islands. True rats are omnivorous and capable of eating a wide range of plant and animal foods. True rats have a very high birth rate. When introduced to a new area, they quickly reproduce to take advantage of the new food supply. In particular, they prey on the eggs and young of forest birds, which on isolated islands often have no other predators and thus have no fear of predators. Some experts believe that rats are to blame for between 40 percent and 60 percent of all seabird and reptile extinctions, with 90 percent of those occurring on islands. Thus man has indirectly caused the extinction of many species by accidentally introducing rats to new areas. We're not facing extinction of anything in our back-yard situation, but in the wake of all this destruction, planning their death didn't seem so harmful.